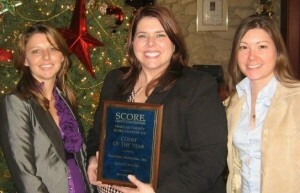 Pinstripe Marketing has been recognized as the 2008 Client of the Year by the Pinellas County Chapter of SCORE. Pinstripe president, Ginger Reichl, received the award at the SCORE monthly meeting, which was attended by members of the district and national SCORE organization as well as St. Petersburg Deputy Mayor Goliath Davis. According to Ron Caffrey, the SCORE counselor who worked with Ginger and nominated her for the award, “Through careful cash management and networking, she has grown her business from a small boutique agency to one of Tampa Bay’s fastest growing full-service firms.” Ms. Reichl added that it was especially helpful to have the discipline of monthly meetings with her SCORE counselors and “homework” assignments between meetings. Since working with SCORE counselors, Ron Caffrey and Carol Gamel, Pinstripe has more than doubled in revenue. SCORE, “Counselors to America’s Small Business”, is a non-profit organization dedicated to educating entrepreneurs and the success of small businesses nationwide. A resource partner with the U.S. Small Business Administration (SBA), SCORE is the premier source of free and confidential business advice for entrepreneurs. To contact SCORE, go to www.scorepinellas.org.